This may not be Kentucky, but if there existsÂ a people who are experts at pretending we’re something or some place we’re not, it’s us, Los Angeles. Celebrate your bets vicariously at the bar with a Mint JulepÂ tomorrow (and today, if you prefer to celebrate early). There are plenty of spots around town to get a good version of the spearmint muddled cocktail. Dominick’s always brings a solid pour to the bar. Enjoy your Mint Julep surrounded byÂ the ’50’s era decor with tiled floors, dark woodÂ and deep booths. Or, since the wind has died down, sit outside on their pleasant patio while basking in the sunshine. Enjoy the recently-revamped space with its modern decor while you sip your Bourbon and mint. As one of the most exciting places to eat or drink in Pasadena, Elements’ Mint Julep comes from a cocktail program designed by Michel Dozois of Neve Ice. What more could you ask for? They may serve food under the “Modern Latin” column, but it doesn’t mean you can’t enjoy the official Kentucky Derby cocktailÂ from a menu designed by Julian T. Cox. The bar in the subtly-lit, elegant restaurant isÂ the site of one of the premier drinking spots in Downtown L.A.
Whatever the cocktail and whatever the occasion, it’ll turn out top notch at Copa d’Oro. Special order up a traditional version or pick one of Vincenzo Marianella’s gin variations (the Freezing Jess includes elderflower and a touch of absinthe). Have a great weekend with your mint-muddled cocktails! 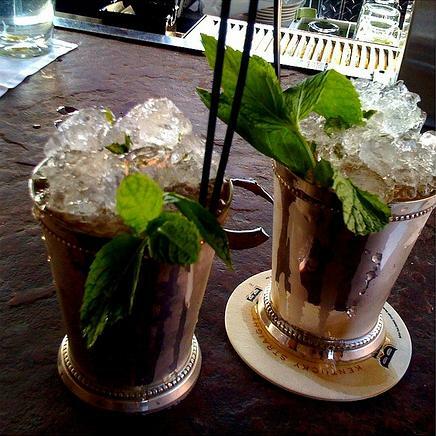 There is something about a mint julep. As cool as the bed of the stream. A fragrance beloved by the lucky. But I think it was born in Kentucky. This entry was posted in cocktails, Downtown LA, Pasadena, Santa Monica, Silver Lake, West Hollywood and tagged cocktails, Copa d'Oro, Derby Day, Dominick's, Elements Kitchen, Julian Cox, Kentucky, L.A., los angeles, Mint Julep, Ogden Nash, Pasadena, Rivera, Santa Monica, Silver Lake, Thirsty Crow, Vincenzo Marianella, West Hollywood. Bookmark the permalink.